Combining data from the NASA/ESA Hubble Space Telescope (HST) and the ESO Very Large Telescope (VLT), a group of European and American astronomers have made an unexpected, major discovery. 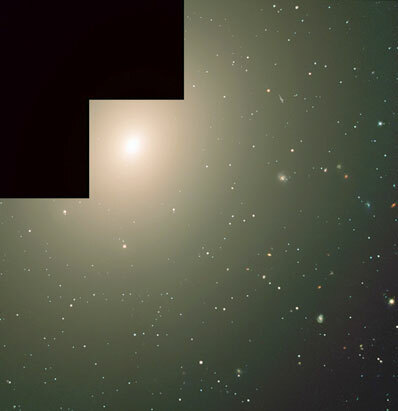 Elliptical galaxies like NGC 4365 have until now been considered to have undergone one early star-forming period and thereafter to be devoid of any star formation. However, the combination of the best and largest telescopes in space and on the ground has now clearly shown that there is more than meets the eye. This important new information will help to understand the early history of galaxies and the general theory of star formation in the Universe. Spectacular collisions between galaxies take place all the time, triggering the formation of thousands or even millions of stars. However, when looking at the Universe as a whole, most of its stars are found in large elliptical galaxies (this refers to their form) whose overall appearance has so far led us to believe that they, and their stars as well, are very old, indeed among the oldest objects in the Universe. This is a surprising discovery since the stars in giant elliptical galaxies were until now believed to have formed exclusively early on in the history of the Universe.